High Road to China (1983), directed by Brian G. Hutton. 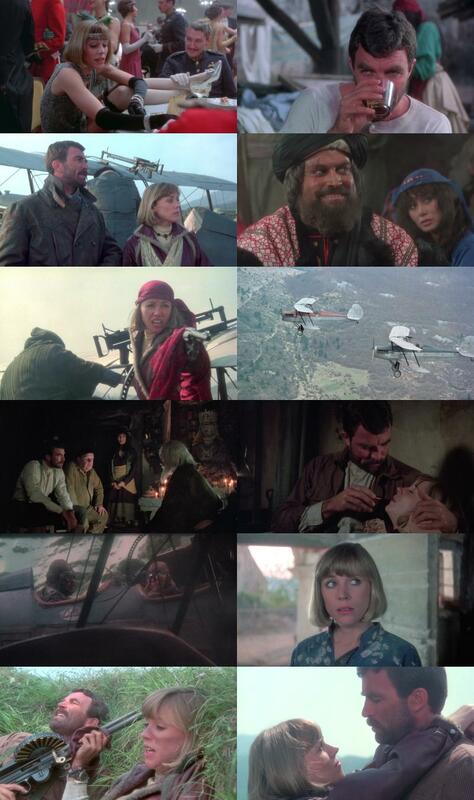 In the 1920s, spoiled but plucky rich girl Bess Armstrong hires drunken WW1 ace Tom Selleck to help find her missing father, a hunt that takes them across India, Afghanistan, Nepal and China. This is in the post-Indiana Jones retro-adventure genre. Nate and Hayes (1983) with Tommy Lee Jones was another. Trekking his and her biplanes across Asia is irresistibly romantic. You can't have fun like that anymore. Selleck is the distilled essence of hunkiness. He had that always-unshaven thing going decades before anyone else. Drunken bum that he is, you don't want to challenge him to an aerial dogfight. Nice aerial photography and plane stunts. Real locations (Yugoslavia substituting for China, etc). Today it would be CGI. Selleck seems unnecessarily sour for a long time after he's taken the job. His post-war cynicism never jibes with the action/adventure tone of the story. They could have turned down the angry romantic yelling from a 9 to say a 6. Where are they getting gas? A lot of the action/adventure just doesn't work. It's hard to say why. Indiana Jones can shoot wildly into mobs of Egyptians and kill them in comically inventive ways and it's all rip-roaring fun. We're pretending we're living in an earlier age, right? But when Selleck strafes and bombs a camp of primitive goat-herders it seems unheroic and unfunny. Brian Blessed as the "Khan" of a Waziristan tribe: good grief. Bring back Voltan the Hawkman -- he'd be more believable. Wilford Brimley as Daddy is just too damn rambunctiously colorful. Yes, they have pink and blue airplanes. I didn't notice it in the theater. I saw this in the theater and it has been on my want-list for years, but was unavailable until recently. My wife had never seen it. Her judgment: "Sometimes these things work and sometimes they don't." But later: "We're keeping this one, aren't we?" I think it's the Selleck Effect. Available on bare-bones Blu-ray. It's about DVD quality, maybe a touch better in spots. It has some black, but the blacks are often crushed. Some dark scenes are very noisy, but that may have been the film.